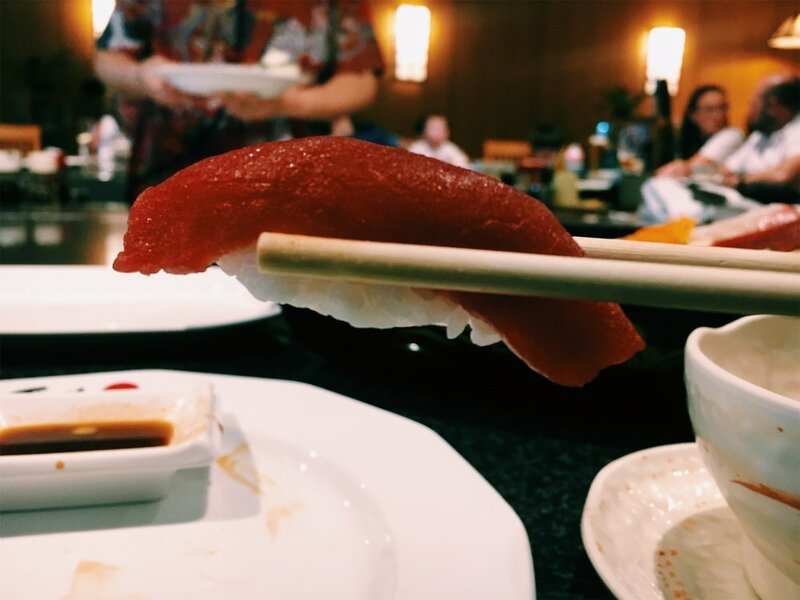 Ever go on holiday to Europe and get a craving for sushi? No? Just me? WELL, if you’re ever in the south of Portugal, right there in the heart of the Algarve in Albufeira, have I got a Japanese restaurant for you. Restaurante Fuji was the angel of fresh fish sent from above a couple of years ago, when my parents and I couldn’t stand to look at another grilled fish and were craving the sweet, sweet tastes of home. My mum being the genius that she is was looking up new restaurants on the Strip and managed to push my dad and I to trying this place out. Lo and behold, we found our holy grail. Teppanyaki, fresh sushi and sashimi, and miso soup all in an air-conditioned Japanese inspired restaurant. After our first trip there we were hooked! The owners are originally from Hong Kong and that of course gave us all that little spark of joy that we were truly getting a taste from home. The staff are super friendly and the food is to die for. 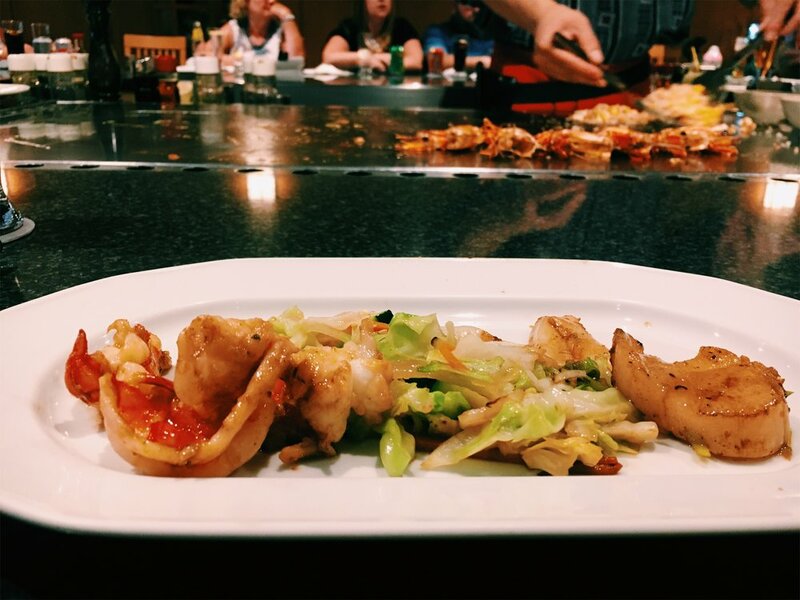 On our last trip there, I decided to share my favourite gem with you all and snapped some pictures of our teppanyaki dinner featuring a sushi starter and ice cream crepe for dessert. We started off with a miso soup with tofu, seaweed, and shiitake mushrooms (yum!) and a sushi boat. The boat features the fresh in-house sushi and sashimi neatly laid out on an adorable boat. The sushi we went for was most tuna and salmon, with a couple of maki rolls filled with crab avocado and cucumber. Show time! The teppanyaki chef starts off by setting the table on fire to heat it up ready for cooking and then gets straight to it. He multi-tasks like a pro and the show is honestly just watching him cook without too much extra flair. He always starts off getting the egg-fried rice ready followed by the most delicious veg, and the seafood. We went for tiger prawns, scallops, and cuttlefish. He more or less cooks everything with garlic butter, soy, and love. I can’t imagine why else the food would taste so good! Next up comes the chicken, steak, and noodles. The noodles are cooked just like the rice, and make a great side carb for the chicken and beef. He dices the chicken up real fine and cooks them off on the side in a teriyaki sauce and tops them with sesame seeds. The beef on the other hand is plopped on the grill, half-way cooked to your specification (we went medium), and then for the second time, the match is lit and BAMN, your steak is on fire and cooked to perfection. Mains = devoured. There are two options for teppanyaki desserts on the menu: a crepe filled with ice cream or fried bananas. Both options come with either a chocolate or strawberry sauce and both are mouth-wateringly delicious. Normally after the mountain of sushi, meat, fish, and rice, I have just devoured I opt for the bananas as they are much less filling, and there’s just something about a good fried banana I can’t resist. But this time, as George was with me we each ordered one of the desserts and had half each. Talk about a perfect man, right? I honestly couldn’t tell you, which dessert was better and if it was socially acceptable to sit there and just eat dessert, I’d be there everyday.